This graph shows the complementary cumulative distribution function (CCDF) of path lengths (number of hops) for probes whose destinations did not respond. The path length is instead the length to the last responding hop. Examining only traces which have responding destinations gives a more accurate distribution of path lengths, but in typical usage there are several times as many probes which do not have responses. However, the traces without a responding destination still give us a lower bound on path length distribution. For comparison, view the IP path length distribution for responding destinations. The complementary cumulative distribution function shows the fraction of collected data points that are greater than a given value. This is backwards from how percentiles are given, as those show the percentage lower than a given value. On this graph, you would find the 80th percentile at the 0.2 Y value. The path length is defined as the number of IP hops required to reach the destination from the Ark monitor. This includes any routing loops that occur during the probing. These values are only used when a response has been received from the destination. In other words, incomplete paths are ignored for the purposes of determining path length. 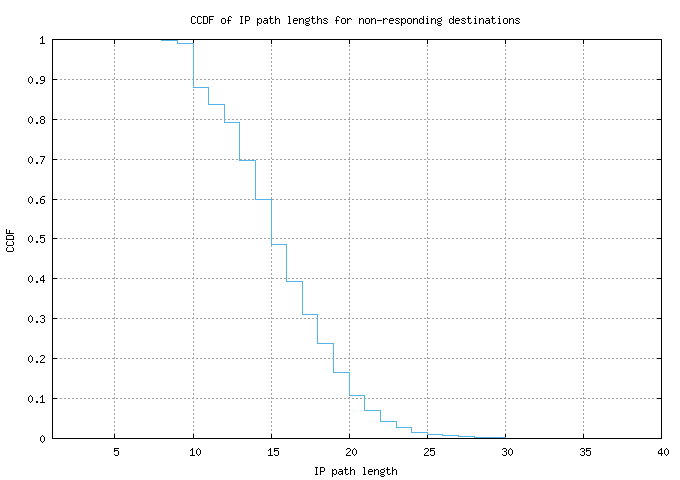 The shape of the path length CCDF typically doesn't very much from monitor to monitor, as the distribution of path lengths to randomly selected set of destinations is mostly determined by the 'core' of the Internet. Routing loops or large internal networks (on the monitor's side) can shift the path length values higher, but the range doesn't vary dramatically. If a monitor's path length CCDF looks suddenly very different from other monitors', it's quite possible that there's a configuration problem in the local network.